Abu Record Fisken Bronze lapel badge in excellent condition. Abu Record Fisken Silver lapel badge in excellent condition. Abu Record Fisken Gold lapel badge in excellent condition. Abu Record Fisken Silver wire embroidered badge in unused condition. Abu Record Fisken Gold wire embroidered badge in unused condition. Rare Record Ambassadeur 5000 advertising display board, approx 15" x 9.5" - 38cm x 25cm This would have stood in a fishing tackle shop to display the reel, there is a little discolouration but appears to be unused - complete with instruction leaflet and red plastic piece (which secures the reel) in sealed cellophane packet. Original item from the 1950,s in excellent condition. Not a recent reproduction. Napp och Nytt catalogue for 1950, 62 pages in very good condition (staples a little rusty). Original Abu Wooden Reel Box, approx 10 1/4" x 4 3/4" x 3 1/8" deep - 26cm x 12cm x 8cm, lined with Blue felt. Originally made for the 50 year Anniversary Record 5000 & Ambassadeur SX300C Reels - Unused. "Ambassadeur of Sweden" Promotional Badge / Sticker, Approx. 4 1/2" x 3" - 11cm x 7.5cm Made from a silky nylon type material. Unused on original backing paper. C. 1970,s ? 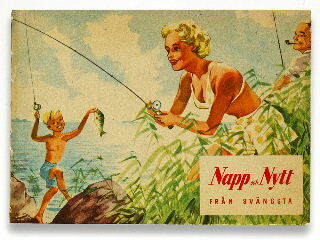 Napp Och Nytt DVD 1948 - 2008 - Produced by Abu Garcia featuring Abu Napp Och Nytt catalogues from 1948 - 2008.